This is being run on a Discourse forum rather than a Google Group which is slightly odd, but I'm sure I'll cope. There's not much traffic yet, but it's only a day old, so that's no surprise. My one question is why they bothered creating a whole new forum for this? It is not like the existing Google Group is overrun with traffic, and it's difficult to see the "language-specific" traffic from requests for assistance or general chatter. TBH, I think all this will do is dilute an already weakened community. Sean did some analysis recently about how a large chunk of the Railo Google Group community didn't seem to make the shift to the Lucee one, and the Railo community was already a small one. So Lucee's is even smaller than that. I really think it's counterproductive to divide it further at the moment. If anything they ought to be fostering more inclusiveness. I realise it's open to everyone, but I think a lot of lurkers or confidence-lite community members will think "this is over my head" or "I wouldn't have useful input" so not sign up. And they're mistaken to do that, as everyone's opinion is worth hearing (not to be taken onboard necessarily, but worth hearing at least!). I've raised a few language-addition E/Rs, so I might start a thread or two to promote those. And at the very least I'll keep an eye on it. 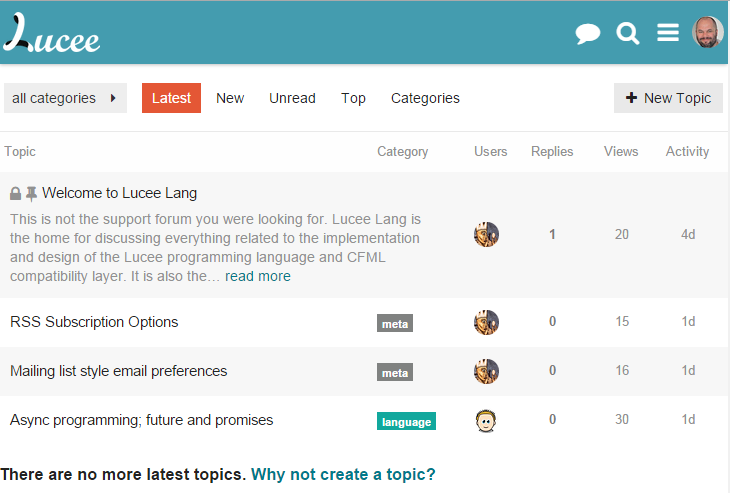 If you're a Lucee or Railo or even ColdFusion users, it's perhaps worth signing up to see what CFML (and "that Lucee dialect which still needs a name") discussions and ideas come forward. Obviously any decent idea for Lucee can also be floated for ColdFusion too, so it's not like it's solely a Lucee resource. It's a CFML resource. And it'll help it to get as many participants as possible, to drum up traffic, which will engender further participation.